Type in 'Image #' box a required through page number of the MUSC copy (1-1042) and click on the GO button. Type a signature of the Third Folio, from fl1 to ¶G6v, without the prefix 'sig.' in 'Signature' box and click on the GO button. Please type [pi] for π meaning preliminaries and [para] for ¶. Please note that you can see the images of the flyleaves by typing in the same box from fl1 to fl7v. The Third Folio has several anomalous signatures. You can search those pages according to the following table, which also includes all the signatures of the preliminaries and the flyleaves. NOTE(2):The Through Line Numbers for the plays which are not in the First Folio and are added to the Third Folio are based on our counting. The printable image will be displayed in another window with white-coloured background. The volume of the file offered here is approximately 250 KB. 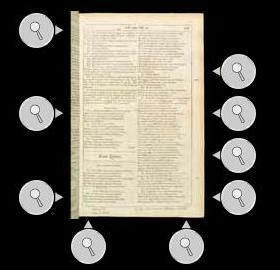 Although underlines are not regarded as "annotation" in the First Folio(the Meisei Copy), they are regarded as "annotation" here. They are usually but not always accompanied by some marginal annotations.